A scene from Lucky General's Amazon Fire TV ad. Amazon Fire TV, the Internet giant's video-streaming box for TVs, has launched a campaign focusing on the product's voice-recognition capabilities. The ad, the first in the U.K. for Fire TV, was created by Lucky Generals. It shows a series of people in their homes using Fire TV, which connects to TVs to allow people to stream films, TV shows and games through Amazon services such as Amazon Prime Instant Video. The device was released in the United States in April. Amazon hopes the ad will position the brand as warmer, more human and more "of and for" the British people. 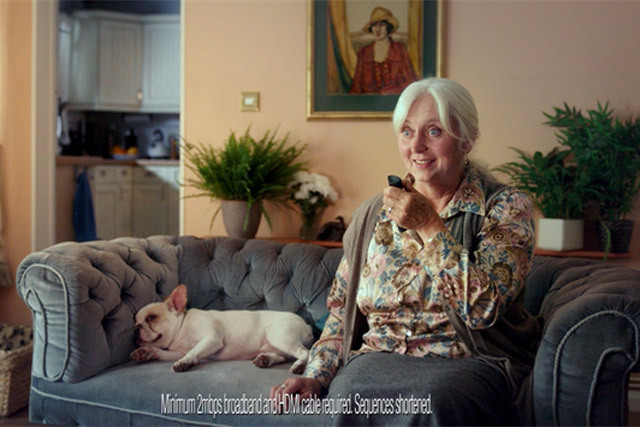 In the ad, viewers use voice-recognition software by speaking into a small handheld device. All are seeking the film "Fast and Furious 6." To demonstrate the sensitivity and effectiveness of the product, and the fact it is fun to play with, the viewers all say the title very differently, but are taken straight to watch the film. The campaign comprises the TV ad and a range of poster executions, which use famous quotes from movies, such as, "Say hello to my little friend." The media planning and buying was by Initiative. Lucky Generals joined the Amazon roster in August. In the past two months, Amazon has ramped up its marketing, sponsoring "Downton Abbey" and launching an ad campaign for the Fire phone.